The challenge to sustaining freshness and purpose is straightforward- it makes no difference whether it be a person or a company. The perennial difficulty is how to create change-within-continuity or equally continuity-within-change. This might be a slightly theoretical, even off-balance way, in which to open a review of what is after all an annual pantomime. But it matters, burningly so. Renewal is everything. There is only one gauge of success for performance- audience. To one side I have a six-year old- a first-timer- who can barely keep to his seat for enthrallment and delight. To the other side is a twenty-something, whose more usual nights out are Akala or Bowling for Soup. We are all- along with another three hundred- at one of three performances this day, having a rapturous time. The result is good for all. “Aladdin” continues until January 19th, another day of three performances, and every performance has “sold out” against it on the Arts Centre website. There is a reason; that is continuity-within-change, or its converse. This is all down to the production team. Richard Cheshire is back on stage as Widow Twankey as well as director. Elinor Powell is in the pit with the baton for the thirteenth time. Lorna Lowe is choreographer. These are seasoned veterans, their longevity almost as long as Theatr y Werin itself. But the wisdom of the show is to give it substantially to the next generation. The majority of the 45-strong cast is under the age of 25 and they are given the bulk of stage time. The framework is unchanged: instant and total love, strange byways, travel across continents, a lavishness of scenic effect. The last time “Aladdin” played, a Dalek wandered on stage for no obvious purpose. In 2019 an elephant makes a late and brief entrance and is seen off with a local joke “You can go back to Tregaron now.” A Go-compare tenor in full regalia makes a sudden appearance. Three characters are sifted into the script to do the Sand Dance, impressively so. Culture changes. Films are edited to a new speed. “Aladdin” still delivers two and a half hours of show, but it is tighter and tauter, more iGeneration-aware than a decade ago. Ping, Pong and Pom Pom (Jordan Ainslie-Rogers, Julie McNicholls Vale and Nick Allen) are still arresting anyone in sight, falling over and truncheoning one another on the head. But the slapstick is reduced and the “we've got to redecorate the palace” scene has gone this year. Health and sugar are serious issues; no sweets are to be lobbed into the auditorium. The launderette scene has been kept for its good jokes. Wishee Washee goes through the mangle and comes out in two dimensional form. One of the policemen trio clambers out of the washing machine on a tiny pair of wheels. “I was put on a short cycle” he says. And of course grown-ups go into the dryer and come out in miniature form. The veterans anchor the show but do not hog it. They come together for the manic “Twelve Days of Christmas” After the woks, the Chinese lanterns day 12 is “twelve gallons of water”. Cue water pistols. But it is essentially a show of a new generation on and offstage. Nils Marggraf-Turley's stand-out solo trumpet introduces the scene set in the Egyptian hideaway. Lovely liquidy tones flow out from Llew Evans' guitar. The company has also altered in character. Students from the University used to play the principals, but the department has changed. Students from Coleg Ceredigion's Performing Arts make the chorus, some of whom- Becca Riches, Tristan Clemas- were first noticed in last summer's “Cabaret.” The company is now closer in spirit to a repertory company with that advantage. Naomi Thorogood makes the step-up from chorus to principal as Spirit of the Ring. Alex Neil grows ever better-bad as Abanazar and Theresa Jones reprises Nefertiti. Maeve Courtier Lilley has a voice that dips low into octaves to thrill. Jordan Jones bounces as Aladdin. They can carry a big ballad with aplomb. There are a few nifty updates. The last scene traditionally is a collective song and Ioan Guile traditionally pulls down a set of comic lyrics. This year two halves of the audience compete to out-do one another in a physical and voluble “Baby Shark”. 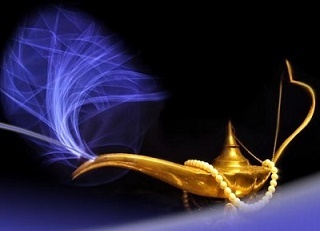 There is another stretch of tradition in that the role of Wishee is played by the same actor as the Genie. There is a mountain of work and dedication behind “Aladdin” but Carl Ryan must be the hardest working performer of the company. He reprises his one-of-a-kind magic spirit but his Wishee plays down the “hiya gang” part. He reports on the suchi chef on the Shanghai shuttle who is a shirt short. He and Richard Cheshire race into an escalation of tongue-twisting alliteration. A few scenes on the Great Noodle (Ioan Guile) delivers a sentence made of words that begin with “p”. “Would you spray that again?” says Widow Twankey. And Carl Ryan delivers one tour de force of a scene, a dozen or more dance pieces cut to seconds apiece. And his double act leads to a scene that Alfred Jarry might have been proud of. The Genie stands centre stage while a cardboard cut-out, fully voiced, represents Wishee, quite surreally brilliant. Pantomime: as strange as it is indomitable, but it is a survivor, because it mutates. This is 2019 and for our time it is Princess Jasmine who grabs a scimitar and takes on Have-a-Mars-bar. Not only that but she throws in a triumphant cartwheel as well.